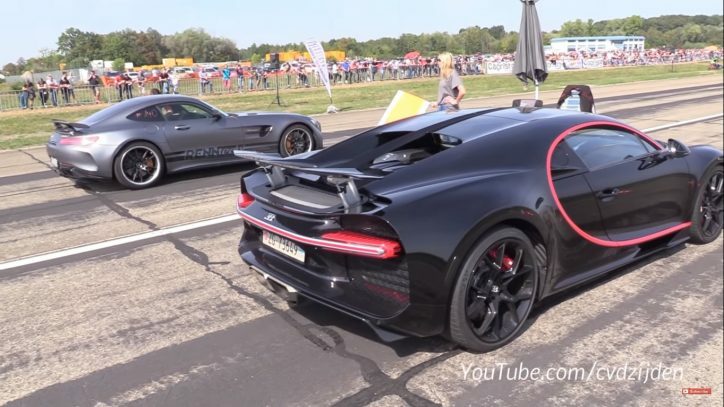 What happens if you pit a Mercedes-AMG GT R against the Bugatti Chiron and the Porsche 911.2 Turbo. We already have a picture of what will happen to the car bearing the three-pointed star here, but what if it has undergone the forges of RENNtech? The AMG GT R carries a 4.0-liter biturbo V8 engine capable of producing up to 577 hp. However, the one in the video here had its output boosted at 760 hp by RENNtech. While the numbers of the Mercedes may sound very impressive, it is still dwarfed by the 911.2 Turbo’s tuned engine that produces 800 hp. On the other hand, its power is nearly half only of the Chiron’s 1,479 hp. The only way to see how the cars will fare against each other is via a 1,000-meter runway. The race shown here is a one-on-one match between the Mercedes and the Porsche, and then another versus the Bugatti. The race involves a rolling start wherein each car must already be running together at 50 km/h before the starting line. Upon reaching the starting grid, that’s the time when the action begins. Sadly, the AMG GT R was beaten by both cars. Aside from the lower engine output of the Merc compared to its competitors, the maximum speed of each auto played a major part in the race. The AMG GT R’s top speed was only capped at 276 km/h while the 991.2 Turbo logged a 306 km/h max speed and the Chiron clocked a 328 km/h run.